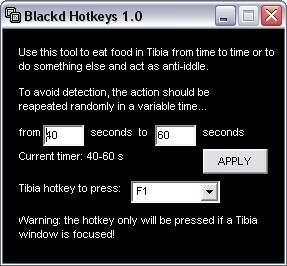 Well, this is a free basic tool that will allow you to autoeat food through hotkeys or just press a hotkey that do something to avoid the automatic logout after 15 minutes. It should be easy enough to use. Just decide the timer for the action (a range of time, to avoid autodetection as cheat) and decide the hotkey that the program will press. To download Blackd Hotkeys, browse to the free tools page or click here.